Join a tour to Tuscany and Maremma that offer a set of features which make this area a paradise for every biker: hundreds of kilometers of winding roads that pass through beautiful landscapes, cultural, and gastronomic destinations of great value and good weather for most of the year. 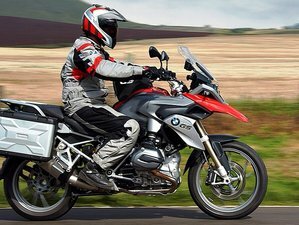 Based on decades of experience, Toscana Moto Tours organizes this tour riding a brand new BMW R1200 GS with an all-inclusive package that includes everything from airport transfers, accommodation, rental bikes, and guide service. Bring your passion for motorcycles and the desire to travel and let Toscana Moto Tours does the rest. You will be offered to stay in different levels of accommodations from Agriturismo, charming Tuscan houses where the service is more simple but also more familiar, to four-star hotels or either five-star luxury resorts. For this option, you will stay at Agriturismo Il Cerro Sughero. The accommodation here has a private entrance, heating, and air-conditioning, electric stove and dishes, satellite-TV, and Wi-Fi, a safe, a bathroom with shower, and a private terrace. Furthermore, there is a washing machine available for the house guests. Please stroll around and enjoy the ample garden, as well as the large pool situated slightly below you. For this option, you will stay at Golf Hotel Punta Ala. It is a resort of long-standing renown set in a location of unrivaled natural beauty. It is set in one of the most beautiful areas of the Maremma region in Tuscany, on the Tyrrhenian coast facing Elba. Beach, wellness center, golf, swimming pool, and excellent cuisine are just some of the services offered by the hotel. Guests are welcomed and pampered in an atmosphere of complete tranquillity. For this option, you will stay at Andana Luxury Resort. The Andana consists of two main bodies, the villa, and the farm joined together by the evocative winter garden that welcomes the hotel lobby and reception, an informal space composed of large windows from which to see the enchanting landscape of Maremma. The interior decor expresses the deep soul of the Tuscan land, made of warm colors, simplicity, and uniqueness. The colors chosen for the furnishings and the rooms are perfectly adapted to the Tuscan style. Toscana Moto Tours will pick you up from Pisa International Airport (PSA). Toscana Moto Tours will drop you off at Pisa International Airport (PSA). My name is Matteo Casuccio and I will be your guide as well as your reference so that you can enjoy an unforgettable trip. I have always enjoyed travelling and I love the land where I grew up where I developed a passion for motorcycles: no road and no path remains a secret for me in this area. I'm a Business Administration graduate and have worked as an export manager for years until I decided to let my passion for motorcycles be my job and share my knowledge of the territories of my land, Tuscany. In 2015 I raced the Dakar, reaching the finish line of the toughest race in the world. The base camp of this tour is in Follonica, Maremma, on the shores of the Tyrrhenian Sea. Follonica's central location in the area is a strategic base, equidistant from the most gorgeous destinations in Tuscany. With secondary roads that wind through typical dream landscapes of vineyards and olive groves, you can reach Chianti, Val d'Orcia, Siena, Tuscia, Volterra, the thermal baths of Saturnia, San Gimignano, Volterra , Pitigliano and Pienza in a day. You will visit places such as Follonica, Scansano, Saturnia, Pitigliano, Sovana, Monte Amiata, Follonica, Montalcino, Abbazia di Sant’Antimo, Bagno Vignoni, Pienza, Siena, Terme del Petriolo, Abbazia di Monte Oliveto, Castellina, Radda e Gaiole in Chianti, Massa Marittima, San Galgano, San Gimignano, Volterra, Bolgheri, Piombino, Isola d’Elba, Tuscia, Val D'Orcia, Chianti, The Wine's Roads, and The Big Blue. You will be served breakfasts and dinners. Whatever you'll choose as your accommodation, something you will not have to worry about in Italy and even less in Tuscany, are food and drink! Please book your flight to arrive at Pisa International Airport (PSA). Transfer from and to the airport is included. Toscana Moto Tours will pick you up from the airport. Toscana Moto Tours provides guided and self-guided tours in Italy, with an all-inclusive formula: rental and personal. They provide any customized solution. Rates might slightly change depending on the desired tour start date. Single supplement is 50 EUR per person per night.